How much does it cost to travel to Korcula? How much money will you need in Korcula? kn542 ($82) is the average daily price for traveling in Korcula. The average price of food for one day is kn169 ($26). The average price of a hotel for a couple is kn703 ($106). Additional pricing is in the table below. These average travel prices have been collected from other travelers to help you plan your own travel budget. Korcula is a Croatian island in the Adriatic Sea. It lies just off the Dalmatian coast. This island is known for its dense forest and the ancient Greeks called the island Black Korcula for this reason. Korcula is one of Croatia's most treasured islands. Rich in vineyards, olive groves, and small villages, and harboring a glorious old town, the island of Korcula is the sixth-largest Adriatic island. Quiet coves and small sandy beaches dot the steep southern coast while the northern shore is flatter and with more pebbles. Tradition is alive and kicking on Korcula, with age-old religious ceremonies, folk music, and dances still being performed to the delight of an ever-growing influx of tourists. St. Mark's Cathedral is the most attractive Gothic and Renaissance building in the old town of Korcula. It was built by local stonemasons in the 14th, 15th, and 16th centuries with the support of Italian masters. The altars are adorned with paintings by Jacopo Tintoretto and some other Italian masters. St. Michael's Church is situated on Antun and Stjepan Radic Square, facing the Town Hall. It is documented at the beginning of the 15th century. During the 17th and 18th centuries., the church acquired its baroque appearance and the chapel dedicated to the Virgin of Consolation was added at the end of the 19th century. The town museum is located in the Gabrielis Palace, which is an outstanding example of 15th and 16th century residential architecture in the center of the old town. The exhibits evoke the cultural and commercial milestones of Korcula from prehistory to the present. The collections explain traditional crafts; in particular, stonemasonry and shipbuilding which were of essential importance to Korcula. Among the most valuable exhibits are the bronze pendant of Tiziano Aspetti and an 1819 piano played by Beethoven's close friend, Edith Streicher. The old city is surrounded by walls, and the streets are arranged in a herringbone pattern allowing free circulation of air, but protecting against strong winds. The town's historic sites include the central Gothic and Renaissance Cathedral of St Mark, the Town Hall and the massive city fortifications. With its lovely architecture, numerous buildings and monuments, cafes, hotels, restaurants, galleries, cinema, etc., Korcula is very popular for visitors as central location from which they explore the rest of the island. A little fisherman's village that is very well known for its finest vineyards and production of unique white wine called 'GRK'. Lumbarda is very popular tourist spot as the only sandy beaches on Korcula - the beach of Vela Przina and Bilin Zal are situated nearby. It's a pretty place and nice location for lazy afternoons ice-creams and coffee in numerous small cafes. The oldest settlement on the island dating back from Illyrian times. The Well preserved village architecture is a must see. Pupnat is probably best known for it's bay of Pupnatska Luka - one of the most beautiful pebble beaches on the Island. Korcula has a wide range of activities to offer. The Island of Korcula is one of the favored walking/hiking as well as cycling destinations in the Croatia. The island is also one of the key sailing and windsurfing destinations in Croatia, with some great things on offer for sailing or surfing enthusiasts of all abilities. If you are a bit of an adrenaline junkie the island offers exciting outdoor adventure activities including: sea kayaking, mountain biking, paragliding, scuba diving, and more. The Island is the perfect playground, boasting a hugely varied landscape just waiting to be explored - from lovely and secluded bays to sandy beaches surrounded by colorful clear sea water ready to be dived into! You could also try snorkeling adventure or buggy tour. If it's a more relaxing break you're looking for, you could make the most of our wildlife and take a day out with Donkey Safari to explore the island's vineyards and countryside or do some quiet bird watching. You can also enjoy a peaceful day of fishing by the sea, or go for a sea fishing excursion. The Korkyra Baroque Festival is a new annual international event. The festival will showcase a selection of the world's leading ensembles and soloists specialized in Baroque music, including the Academy of Ancient Music (Great Britain), Le Parlament de Musique (France), Currende and Erik Van Nevel (Belgium), La Venexiana (Italy), Red Priest (Great Britain), Croatian Baroque Ensemble (Croatia) and others. Twelve concerts will be held over ten days along with a series of supporting events focusing on Baroque music. The Moreska Sword Dance is Korcula's proudest tradition and one of the Adriatic's most unusual customs. At one time this "fighting dance" was prevalent in southern Europe. Essentially, it's a danced version of a sword battle and tells the story of an abducted princess. The story begins with a speech by the princess who declares her love for the White King (dressed in red for the dance). Unfortunately for her, the Black King is in love with her and has stolen her away from the White King. As the colorful spectacle progresses, the armies of the White King and the Black King draw swords and "fight" for the princess. Although the dance was performed in many Mediterranean towns through the 19th century, now it is only performed in Korcula. Not only is Korcula relaxing yet with plenty to do and explore, it also has a thriving food scene. From traditional konoba's, cafes, to restaurants and wine bars, the food here quickly will be a highlight of your trip. A string of venues line ulica Korculanskog Statuta or the surrounding street of etaliste Petra Kanavelica in Korcula town - ranging from the dependable (Pizzeria Caenazzo) to the decidedly chic (the LD restaurant at the Lesic-Dimitri Palace Korcula) so there's something to fit your taste and budget, whatever that might be. Alternatively, sample one of the rustic bistros advertised on wooden signs by the road between Korcula town and Vela Luka. Korcula island is known for its sweet cakes. Under the general heading of cukarini, they come in different varieties, such as prikle (deep-fried dough with almonds and raisins) and lumblija (sweet bread with wine and spices). Marinero has their cakes baked fresh daily. Another renowned cake shop, Cukarin, is set in a side street in the Old Town. Korcula nearest airports are Dubrovnik Airport and Split Airport, both are convenient for reaching the island. 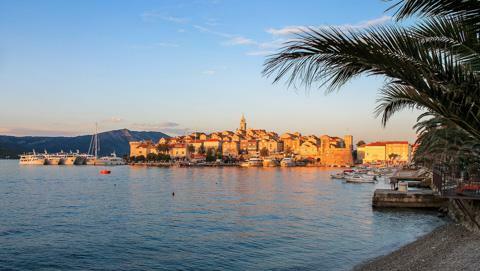 Korcula is well connected to the Croatian mainland and Dalmatian coast, especially in the summer months. Boat connections are less frequent during the off season, so you would need to rely mostly on buses to and from Dubrovnik and early mornings ferry to Hvar and Split. The main bus service on Korcula island offers regular routes connecting most parts of the Island so the island's bus network connects the villages with other main areas. Taxi and shuttle boat services are also available. A rental car is also a good way to get around and parking in the city is suitable for renting a car. While there is no public transit options in Korcula, it's small enough that you can walk most anywhere. It's a straightforward layout so you likely won't get lost. There's a main street that cuts through town and then several roads that cross through that road and head for the ocean. There's also a pedestrian road that encircles the entire town. If you're interested, there are bikes available for rent throughout town. To head to some nearby towns, consider taking a water taxi. You can go to Kantun Tours and rent snorkeling equipment for around 25 kn a day or 110 per week. The island has several good snorkeling places around it. If you're more adventurous you can also rent a kayak and head out to some other nearby islands to explore and do some snorkeling. One of the best options is Barija Island which is on the southeast shore. It really gives you a unique experience to see the underwater world.